Wounded of Dunkirk | Hill End, Wartime Hill End | Out of Sight, Out of Mind? 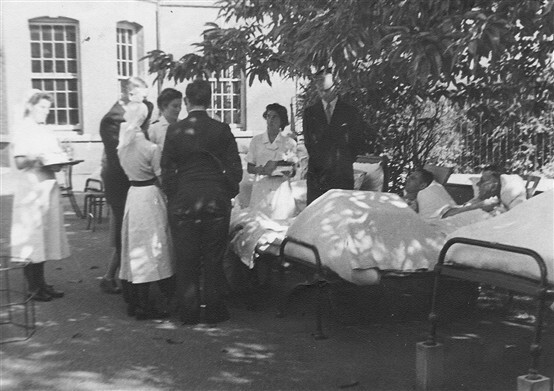 ‘As the war hotted up, more patients began to fill the Hospital beds. 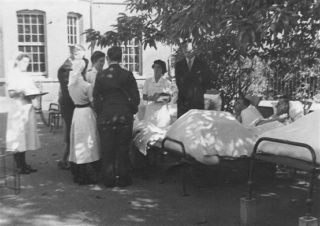 Very early one morning in Spring 1940, the Assistant Matron came to the nurses’ quarters and woke us up saying there had been an evacuation from the Continent and many wounded were expected to arrive that day. We knew this was to be something special and of course it was – Dunkirk. Doctors, nurses, porters, operating theatre staff – everyone was on duty. No one knew what numbers of admissions to expect and I must say it was an anxious, tummy-churning time waiting for the first arrivals. The large hall had been made ready to receive the wounded and before long they began arriving. Initially, the were laid on the floor for examination and diagnosis, then sent on to the appropriate wards. There was a great ‘jumble’ of patients – you name them and we had them: French civilians, male and female; Belgium sailors, ATS, and our own troops, all collected at our shore or from the sea by Churchill’s ‘Little Ships’ Rescue Armarda. These wounded men had been travelling for days by boat and train, many still in battledress uniform. Many had died of their wounds before reaching hospital. The survivors had field dressings with battlefield dirt still on them. Six to eight operating theatres worked non-stop day and night. Most of the cases were surgical, suffering gunshot wounds, frequently in the back from fleeing an over-riding enemy as best they could. Others had shattered limbs and friction burns on hands and arms from sliding and falling down cliffs in their hurry to find safety. We all worked ceaselessly round the clock, instructed by our Matron, Mrs Thacker, to work four hours on, four hours off, with meals fitted in whenever we weren’t sleeping. The strain of everything combined was terrible. This went on for four days – until every wounded man had passed through a theatre and had been thoroughly inspected under anaesthetic, his wounds cleansed and dressed, and limbs put in plaster. We nurses picked out bits of shrapnel with forceps as patients were turned over and over. Providing the wounds were surgically cleaned, the general idea was to cover them in plaster of Paris so that both bone and wound would heal together beneath the covering, Drugs such as M & B and sulphur were used either as medication or as powders dusted onto flesh wounds. The old-fashioned methods worked wonders; only four cases of gas-gangrene were recorded, a wonderful record considering the filthy conditions of some of the wounds. Many soldiers had been lying in fields and orchards for several days, cared for only with temporary field dressings.